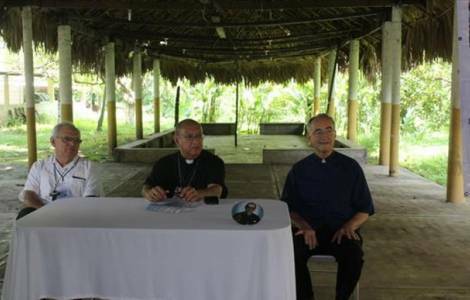 AMERICA/MEXICO - Fourth border Bishops' Meeting: "Need to avoid the criminalization of migrants"
Tapachula (Agenzia Fides) - Migration has now become a "humanitarian crisis" on the southern border of Mexico with the Central American area: is one of the conclusions drawn up by the Bishops who participated in the Fourth border Bishops' Meeting of Mexico and Central American countries on migration, held in Tapachula (Mexico) on 29 and 30 August. The Bishops highlight, in the final document sent to Fides, that migratory flows have increased due to poverty, lack of development opportunities, social exclusion and violence, particularly in Central American countries. On this point they argued that governmental migration policies driven by the safeguarding of sovereignty and economic power become anti-migratory policies; even if there is a strong presence of insecurity because of organized crime and drug trafficking. The Bishops of El Salvador, Honduras, Guatemala and Mexico attended the meeting, who stated that in their countries migrants are being excluded and lose their rights and dignity. They also stressed that it is essential to support and promote migration policies at the highest level. The concern of the Church also highlighted the lack of concrete initiatives that raise awareness of the population on migration in order to avoid the criminalization of migrants.